I’m a Scientist get me out of here! After an initial rejection in 2015, I was finally chosen as a contestant on “I’m a scientist get me out of here” in November 2016. At first I was so pleased, then the horror of how much work I had to complete during the same period of the competition hit me. However, the event was fantastically organised, which meant all I had to do was log on with a cup of coffee and chat. “I’m a scientist get me out of here” is a free online event, which enables school students to interact directly with scientists through pre-booked live chats and posting questions in the “Ask Zone” online. The aim is to engage students with real science by real scientists. For me, it was to break down some of those misconceptions about scientists (The Mad Scientist: Scientists are men in lab coats, mixing potions with the IQ of Einstein) and to show them that being a scientist whether you’re male, female, young or old is an achievable goal. The competition lasts two weeks and you are designated a zone with four other scientists. There is a maximum of three 30 minute live chats per day, which you can sign up to if you are available. In your own time, you can answer questions the students send you. Students challenge scientists by asking anything they want and vote for their favourite scientist to win a prize of £500 to communicate their work with the public. A monoculture of the invasive alien plant Impatiens glandulifera (Himalayan balsam) along the river Earn, Stirling. I was the Alien Plant Hunter scientist in the “Plant Zone”. I was actually really nervous…wondering if I had to spend the entire time googling answers… (yes, I did a few times..). The questions across the two weeks varied from questions about my decisions on becoming a scientist, such as, “Why did you become a scientist?”; “What else would you do if you weren’t a scientist?”; “What is the best thing about being a scientist?” and whether i liked being a scientist to specific questions about my research, such as, “What is an Alien Plant Hunter?”; “Are aliens real?”; “What is the best plant you have found?” and “What is your favourite plant?”. Some of the questions even got a little creative with one student asking “What planet would you live on besides earth?” and “If you study plants and eat meat, does that mean you are cheating on plants?”. Lost in dense alien (Himalayan balsam-Impatiens glandulifera) undergrowth along the River Endrick, Scotland. These were my favourite because I was not good at science at school (I got a D for GCSE) and I did not enjoy science, besides a bit of Biology. My science journey only began in my 20s, as I had left school young and started working in the cosmetics industry. Therefore, these questions enabled me to get across the message that we all have different paths and opportunities, but that there are always more options for challenging yourself and finding other careers that you may be passionate about – that’s why outreach is so important to me. 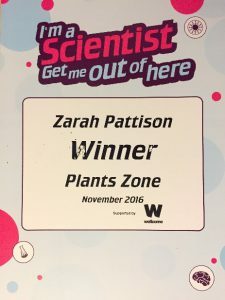 My certificate from ‘I’m a scientist get me out of here!’ 2016. Regardless of being busy, the competition was well worth the time I spent. I would highly recommend this event for anyone who wants to get involved with outreach activities. The students taught me so much and changed my perception of them. They are curious, engaging and positive and also taught me to step up my game on basic plant biology! A total bonus was that I won the competition and now have £500 to continue with outreach work in 2017 – so watch this space! 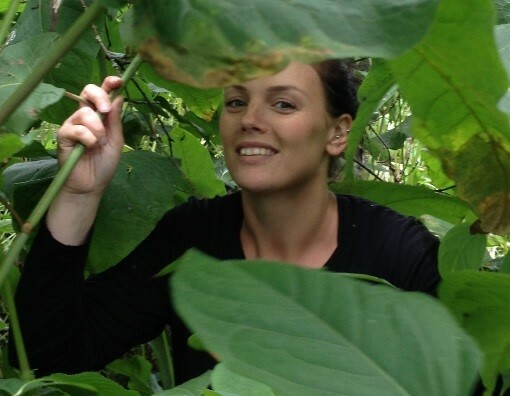 Zarah’s research interests are broadly in freshwater ecology, particularly invasive species and pollution dynamics. 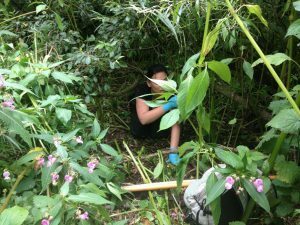 She is interested in responses of invasive alien plants to changes in climate and how this may indirectly impact native communities and competitive interactions. 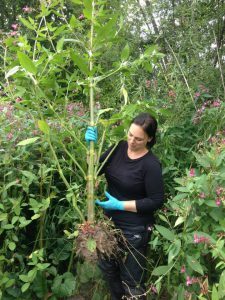 She is currently working as a postdoctoral researcher on the Hydroscape project to address questions relating to connectivity and stress in freshwater lochs & lakes and how this affects the presence/abundance of faecal indicator organisms (for example E. coli) in these systems.